Kate Winslet was so committed to her role in Divergent that she insisted on performing her own stunts despite being pregnant with her third child. 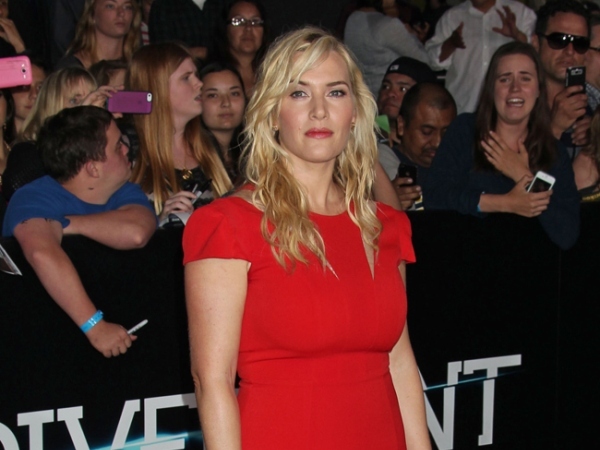 Kate Winslet did her own Divergent stunts while pregnant. The actress - who gave birth to a son, Bear Blaze, three months ago - was so hands-on during filming for the highly-anticipated big screen adaptation of Veronica Roth's bestselling teen triology that she refused to have a stunt double on set until director Neil Burger put his foot down. Speaking at the US premiere of Divergent, Veronica told People magazine: "It's pretty funny because she was pregnant when we were shooting, but she wanted to do her own stunt falls. She did a couple. She's you know, very careful about it, and then finally Neil Burger was like, 'Okay I'm too nervous - you can't do this anymore.' She was like, you know, taking-charge lady - she powers through. It's really impressive." Kate - who also has children Mia (13) and Joe (10) from previous relationships - was so "committed" to her role as cold and calculating leader of the Erudite faction, Jeanine Matthews, that she insisted on making her performance as realistic as possible. Neil added: "We had to refit all of her wardrobe, but then there is a scene where she fights Shailene [Woodley] and she was like, you know, taking the falls and I'm like, 'Stop, you're pregnant.' But she was still wanting to do it with as much action. She's a committed actress and she's a committed mother, too. But she is just completely there, and you kind of just have to stop her."